Happy election day! It has been a very long day, and I have more anecdotes and analysis than can fit into one blog post. So let me use this blog as a platform to give an "on the ground" view of the administration of the elections, showcasing pictures from the field. More details tomorrow! Apologies for the late posting -- as my cab was driving up to the hotel last night at 7:45, one of my journalist colleague from the Netherlands was waiting for her driver to take her to the opera. She saw me and exclaimed, "I need a driver, and I have an extra ticket to the Astana opera, would you like to come?" I mean, how could I say no? So hence the delay...but I can say with confidence that a visit to the Astana Opera is a MUST. A briefing held by Zhangul Kusmangaliyeva and Nurlan Yermbetov of the Central Election Commission for foreign journalists. Funny, because I ran into Yermbetov at the polling station today. An informational poster that explains the rights of voters and observers. 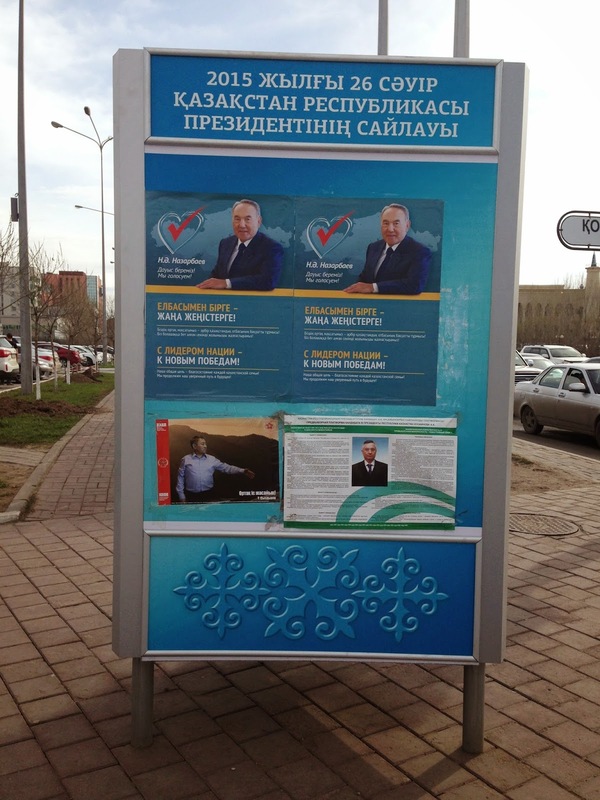 The campaign posters for Nazarbayev (top), Kussainov (bottom right), and Syzdykov (bottom left). A school where voting occurred. Information on voting. Notice that the information appears in both Kazakh and Russian. The ballots are also in Kazakh and Russian. In terms of political culture and election day paraphernalia, Americans have "I voted" lapel pins, and Kazakhs have photo boards. Different strokes for different folks. 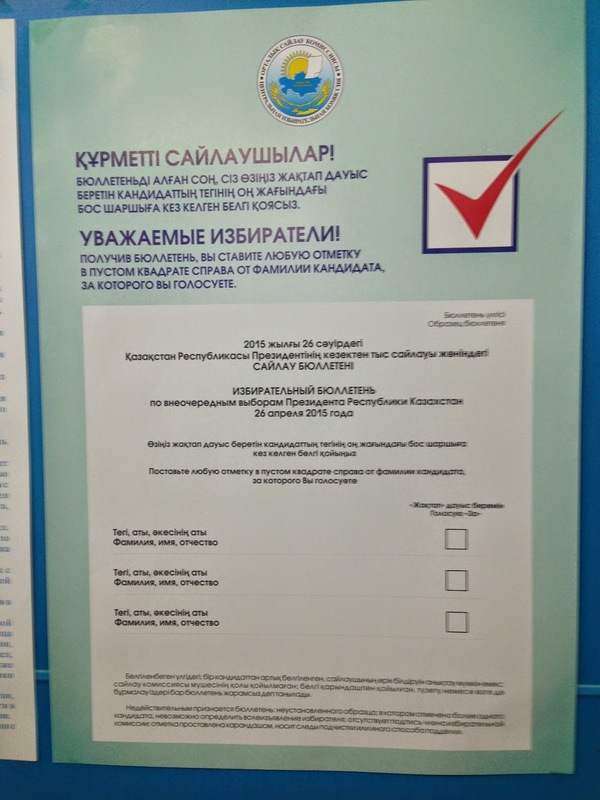 A sample ballot (in poster form). An informational board for the elections. Voters waiting in line. I sat for over an hour in the designated area for media, observers and lawyers. I noticed some individuals were in line for over thirty minutes, until they could verify their ID and then vote. Voters registering. I chatted with two Kazakhstani observers -- both women were int heir 40s and decided to volunteer for the day. Several thousand observers were deployed throughout the country. The observers counted people as they entered. The gal I chatted with, indicated that some 800-1,000 people entered her room alone! They also watched to make sure there was no funny business. I asked them to explain the voting procedure. It works the following: you present your registration document (where you live) and an ID to the individual at the desk, sign in, and get a ballot. You then enter behind the curtains, select your candidate, and drop the ballot into the box. You are then on your merry way. They did not explain the counting and verification process. The three candidates at a school where voting occurred. The Central Election Commission (CEC). A representative of the CEC gave a briefing with the number of votes at 11 am, 1 PM, 3 PM, 5 PM and 7 PM. The ballot stations opened at 7 AM and closed at 8 PM. There were 9,741 polling stations throughout the country, and there are 9,518,897 registered voters. To provide some context, the population of Kazakhstan is 17 million -- give or take for unregistered migrant workers from the Commonwealth of Independent States (CIS). The official Kazakhstani labor force is ~10 million, so this the number of registered voters is roughly accurate. Interestingly, however, the CEC releases the amount of votes casted, but does not release for which candidate the votes were casted, or any preliminary results. In fact, it was not until after 12:00 local (Astana) time, when the exit poll results were released: President Nazarbayev won with 97.5% of the vote, while Kussainov secured 0.63%, and Syzdykov garnered 1.87%. A representative of the Ministry of Interior and a translator giving a briefing at the CEC noon. 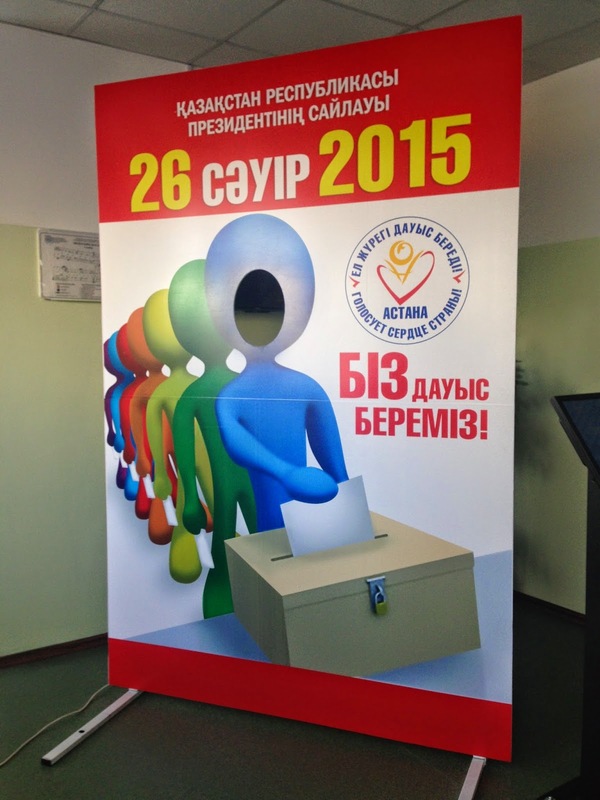 By law, the law enforcement bodies work from April 22-28 for the elections, as does the general prosecutor's office. Some 20,000 police officers were deployed throughout the country. 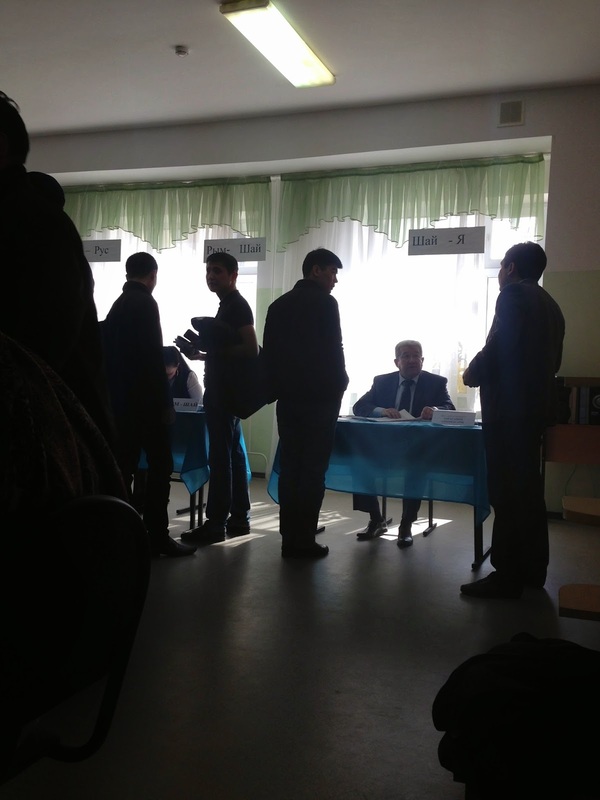 In Karaganda oblast, where floods have recently wreaked havoc on rural populations, efforts were made to accommodate such voters. The press area at the CEC. Members of the local media at the CEC. Say what you want about the elections, but certainly members of the media take their job very seriously. The CEC was swarming with activity, as election results came in and journalists rushed to post the results. It was a younger crowd, of course. 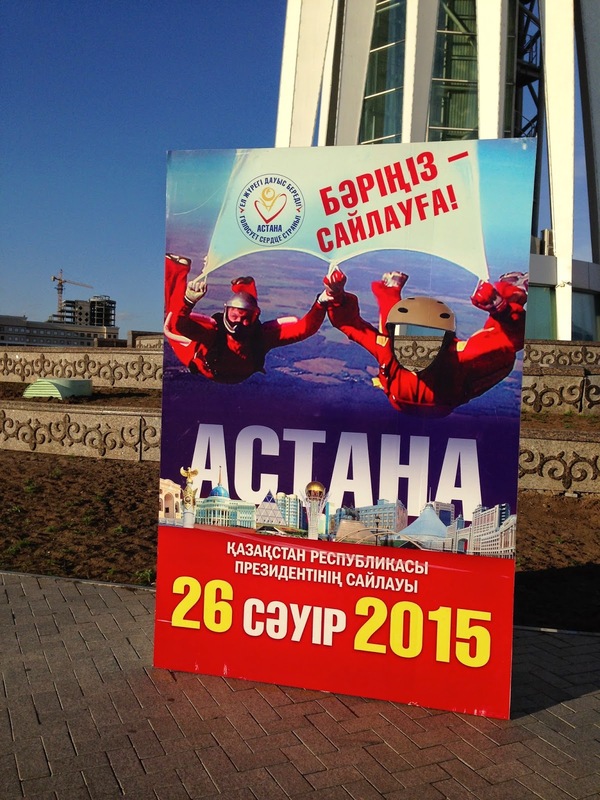 In fact, the average age in Astana is 32. This of course, is a reflection of the fact that Kazakhstan is a young government and that at the time of the collapse of the Soviet Union, it only had a handful of experienced statesmen. This explains why so many high ranking officials are young, relative to Western standards. Election observers from Bulgaria. Throughout the day, international observers delivered remarks at the "Duman hotel," where many international journalists are staying. Kudos to the Ministry of Foreign Affairs for their organization.